About this item: Seji Taram transforms Balinese suar wood into a beautiful wall sculpture. Frangipani blossoms nestle beneath the Hindu omkara symbol. 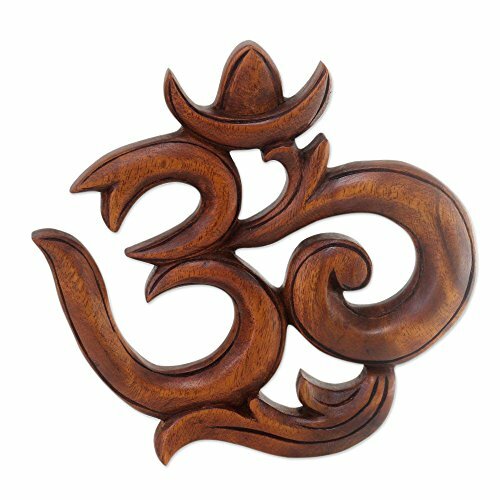 Known as om or aum, omkara is the root of all sounds, emitted as a mantra during meditation. It is believed all desires will vanish, thus attaining self-realization and the highest of knowledge. This one letter symbolizes the most high in the Hindu pantheon, representing every kind of trinity such as Brahma-Vishnu-Shiva, past-present-future, birth-life-death; creation-preservation-destruction, and waking-dreaming-deep sleep. About our Artist: My name is Ketut Taram and I was born in the Gianyar regency, Bali, in 1967. I learned how to create my first sculpture from my older brother, Made Mudiawan. From 1975 until 1990 I worked primarily in suar wood. Then, from 1990 until 2000, I made the sculptures from sandalwood. Lately, I enjoy sculpturing with both. I began carving on my own in 1992; before I'd worked together with my older brother, saving until I had enough money to open my own workshop. There are five people working with me now. Balinese culture and tradition inspire my artwork. As the son of Wayan Kicen, a wood carver, it is easy and enjoyable for me to transfer my imagination into my work. I have participated in several exhibitions around Bali. Thank you Novica for promoting my artwork to the whole world. Through my art I do hope to provide a good life and a better future for my family, especially for my little child. Exceptional Artisan Quality by Ketut Taram - crafted with care to be treasured for years to come.